February 8, 2018 — The Consortium for Top-Down Proteomics has published the first standard notation, called ProForma, for writing the sequences of fully characterized proteoforms. ProForma allows researchers to readily communicate and share proteoform information, and the notation is the unambiguous, human readable, and can easily be parsed and written by bioinformatic tools. This should help simplify storage and comparisons, and increase the utilization of proteoform information, leading to new discoveries. Richard D. LeDuc, Veit Schwämmle, Michael R. Shortreed, Anthony J. Cesnik, Stefan K. Solntsev, Jared B. Shaw, Maria J. Martin, Juan A. Vizcaíno, Emanuele Alpi, Paul Danis, Neil L. Kelleher, Lloyd M. Smith, Ying Ge, Jeffrey N. Agar, Julia Chamot-Rooke, Joseph Loo, Ljiljana Paša-Tolić, and Yury O. Tsybin, Journal of Proteome Research, published online February 5, 2018. 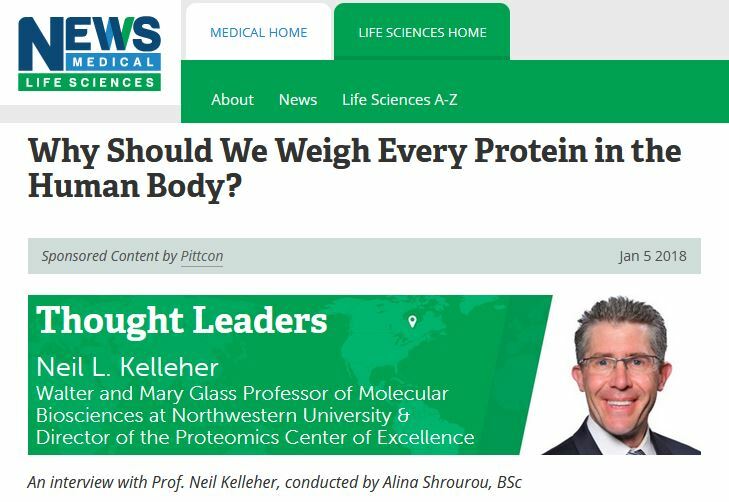 This interview with Neil Kelleher, Consortium President, explains the importance of Top-Down Proteomics for understanding biology and accelerating drug discovery efforts. https://www.topdownproteomics.org/wp-content/uploads/2018/08/CTDP-logo1-w-tagline-300x152.jpg 0 0 Paul Danis https://www.topdownproteomics.org/wp-content/uploads/2018/08/CTDP-logo1-w-tagline-300x152.jpg Paul Danis2018-01-08 17:31:082018-02-09 21:54:32Why Should We Weigh Every Protein in the Human Body? CAMBRIDGE, MA–(Marketwired – February 28, 2017) – The Consortium for Top Down Proteomics today announced the launch of their inter-laboratory study for characterizing monoclonal antibodies (mAbs) by top-down mass spectrometry techniques. With the continuing growth in the development and adoption of mAbs for a wide range of therapeutic uses, there is increasing demand for higher quality characterization of these complex species.